This copper wire work maple leaf is adorned with beautiful tones of red and orange gemstone beads and Czech glass. Celebrating the autumn equinox and the turning of the leaves as the season begins to mellow. Hang in your window or out on the patio for year round sparkles of warm colour. 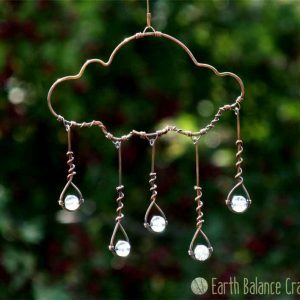 This copper wire work suncatcher captures the a torrential rain storm, when dark storm clouds gather and heavy rain drops begin to fall. It is a kinetic wall hanging swaying with gentle movement. It has two kinetic qualities, one at the top of each rain drop and one at the base of each rain drop. The design will sway softly as the air moves, helping the beads to sparkle and shimmer. 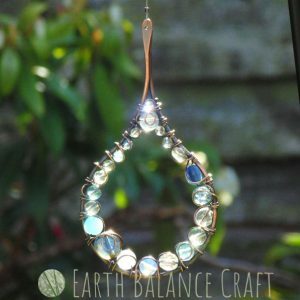 It is designed to hang in a window where the sun can shine through the translucent beads. This luxurious metal suncatcher features my favourite species of British wildlife, three clouded yellow butterflies and an azure dragonfly surrounded by pretty foliage. 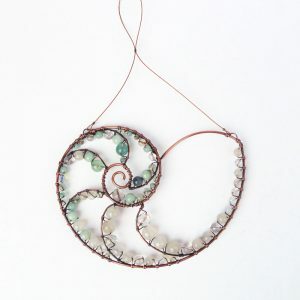 Handmade with copper wire-work wrapped with semi-precious gemstones and Czech glass. Adorn you walls with a colour palette of soft yellows and light greens, punctuated with bright azure blue. A truly artistic piece for the home that celebrates the natural world and my love of flutterfbyes and river darters.